Why in the world would a theologically-informed lover of all things related to Scripture and the church consciously identify with a movement that is often associated with people like Benny Hinn or Todd Bentley? Don’t guys like that make me “theologically sick”? Yes, they do. 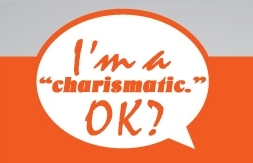 But that doesn’t mean that I still don’t consider myself essentially “charismatic.” Those guys also consider themselves “Christians.” Should we stop using that term just because some wing-nuts use that term too (some Mormons use that term too!). I’ll probably weave in-between these different reasons in order to keep you readers engaged. I’ll also be sharing a lot of personal stories too, so you’ll have to simply take my word for it… or call me a liar (ha ha!). When dealing with exegesis and interpreting history, readers will have the opportunity to engage with what I offer as with any other theological offering. Luke, have you seen my short apologetic for the charismatic? Waiting with bated breath. What can I say, my Dad got healed at a Benny Hinn crusade of throat cancer and to think I was vehemently oppose to him going, he said he would go if I would stop going to Toronto renewal meetings. I suppose I am charismatic because of exegesis, Hermenuetics, history and lots of experience. I am also a proud fundamental evangelical despite the false doctrine of cessationist and grumpiness of John MacArthur….LOL! YES! Excellent points. Thank you for posting this. As I said on FB, I am greatly looking forward to reading more of this, Luke. Sean, I don’t doubt that God is gracious to people even in the midst of the worst doctrinal positions out there… thank God for his grace!